ATHENS, Ga. -- A week after playing with needed intensity against Florida, the Georgia defense is preparing to play fast. Ole Miss has employed a hurry-up offense this football season under first-year coach High Freeze, often snapping the ball as soon as it's spotted by the official with the intent of keeping defenses in disarray. It has not been hard to detect confusion among Georgia's defenders this season, and the Bulldogs were expressing concerns Tuesday about the quick-snap Rebels. "They're the fastest team we've faced this year, and I can't remember a team that goes this fast since I've been here," senior cornerback Sanders Commings said. "It kind of reminds you of Oregon. I've seen on film where Alabama's defense was looking to the sideline for the play call when Ole Miss was snapping the ball and their receivers were running down the field." The up-tempo Rebels have raced to a 5-3 start by amassing 3,440 yards (430 a game) and 259 points after compiling 3,375 yards and 193 points in last season's 2-10 debacle. Their production is evident but not without controversy, as Alabama coach Nick Saban complained about fast-track offenses after his Crimson Tide defeated the Rebels 33-14 on Sept. 29. Saban said a defense's inability to line up against a hurry-up offense could result in a greater chance of players getting hurt. He added that it's become a tremendous advantage for offenses to play fast before asking, "Is this what we want football to be?" Freeze has defended his rapid pace since, including this week when he was asked about the tempo making opponents uneasy. "I don't know if I've ever thought in terms of taking joy in making someone uncomfortable," Freeze said. "I take joy in giving our kids a competitive advantage. I do think that when we are in our fastest tempo, it's very common that you don't see but just a few different looks. You're not having to block 18 different fronts and different stunts because it would be difficult for a defense to carry their whole repertoire and package when you're in your fastest tempo. "I do take pleasure if that somehow gives us an advantage in competing with a team." Ole Miss has run 573 offensive plays this season, nearly 40 more than Georgia. 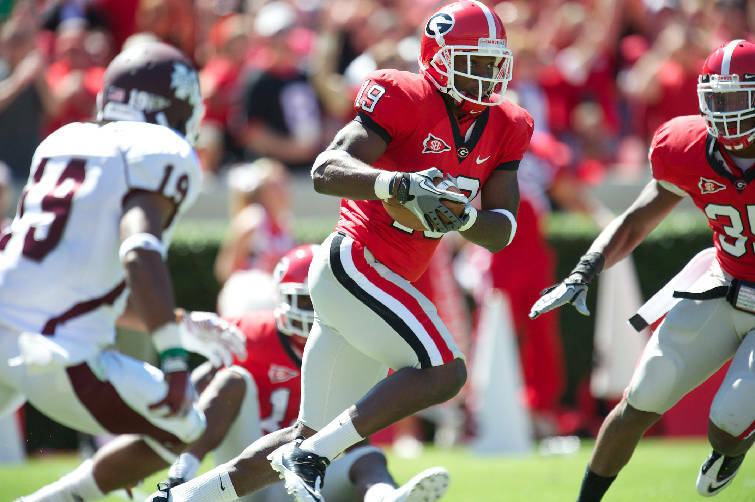 The Bulldogs have sped things up this season as well, but coach Mark Richt said there is a difference. "We have times where we'll go fast," Richt said, "but we have times obviously where we'll try to make it look like we're going to go fast, and then we'll freeze our count to try to see what they're in and then make the call from there. It becomes a little bit of a guessing game at times, but we don't go as fast as they go." Richt also likes to substitute a player or personnel groupings to create problems for defenses. Asked about Saban's comments, Richt said offenses can go as fast as they want if they're not substituting. Even when offenses do substitute, the officials "don't give the defense very long." Georgia defenders were mostly in agreement with Saban's stance. "It's really not fair, because football is about the best team winning and not the fastest team or the team who can get a play off when the other team isn't ready," Commings said. "I think the referees should wait until the defense is ready. If they are better than us, then let it be when both sides are ready and them not catching us off guard." Said sophomore cornerback Damian Swann: "We have to sub less, and when they sub we have to sub. That's how we have to play, and we have to be ready." Senior inside linebacker Christian Robinson wasn't so sure. "If they're beating us, then we need to figure out a way to stop it," Robinson said. "That's not a safety issue. That's a defensive issue."